Bridgers is an established family run Farm, nestled on the outskirts of Hurstpierpoint, beneath the South Downs in the heart of Sussex. Bridgers Farm has been rearing Turkeys for over 30 years and our mission is to ensure that all our birds lead a happy, healthy life. 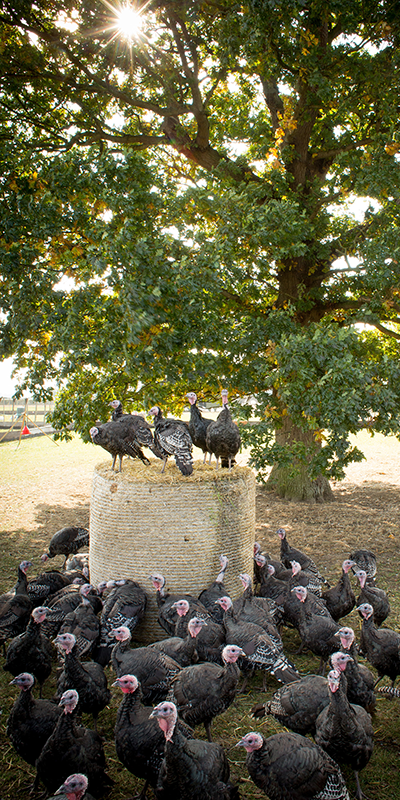 We raise traditional bronze and white farm fresh turkeys including both free range and barn reared. We pride ourselves on caring for our birds in outstanding welfare conditions and in recognition of this we are proud to have sustained the Golden Turkey quality standards kite mark for the past 12 years. There is no other Turkey farm in Sussex with this quality standard and it is the opinion of our customers (see some of our reviews here) that you simply will not find a better tasting bird! Many of our customers have been with us since Bridgers Farm opened its doors over 30 years ago and our aim is simple, to keep them (and you!) coming back each time you have a celebration and in particular for your big day at Christmas. Christmas begins when you pick up your Turkey! So we ensure a festive atmosphere on the Farm, with Christmas music, mulled wine, tea & coffee, mince pies as well as sweets for the children! Our birds are cared for and pampered by Anthony Harris and his expert team. Passionate about promoting healthy eating, he has appeared on television, radio and a broad range of broadcasting platforms, if you'd like to find out more about Anthony and his team please get in touch, he'd be happy to help! When you order a "Golden turkey" you can be sure of the tastiest possible Christmas meal! Make sure your Turkey is a Bridgers Farm Turkey! Get in touch to reserve your Turkey - order online or direct from the farm now.